Stir fry- It seems like such a simple main dish to master. Veggies, lightly fried in a pan, with sauce. Regardless, over the years I have made many inedible stir fries that went into the trash. Soggy, limp, overly salty, disastrous flavour combinations and unsatisfying. I consulted the internet and found ridiculous and difficult recipes that included ingredients such as ketchup and sugar. For years now I have believed that there is a stir fry recipe conspiracy. My vision of a perfect stir-fry is a piping hot dish of fresh vegetables, that are still intact both in form and true flavour, colourful and vibrant, lightly glazed in a layer of chillies and salt. When we received the Breville Wok for a wedding present (Best “Off the Registry” Gift Ever from Tim and Dan), it was time to figure this disaster out. After about 12 attempts, I figured out the crucial basic steps. I have shared them below because I can not be the only person outside of Asia to get this technique wrong. #1 Buy the extra firm tofu that is not packed in water. The tofu magically sears within a reasonable amount of time (tip courtesy of the brilliant couple who gifted the wok). #2 Find a good chilli paste in the Asian food aisle that matches your palate. They are labelled with helpful terms such as “sweet”, “hot”, “mild”, “Asian Hot”, etc. You can also get a hot bean paste. The idea is to add a spike of flavour. You don’t want to drown the vegetables until they are unrecognizable. #3 Find all the best vegetables in season for the freshest fry. Right now, great stir fry vegetables in season include asparagus, bok choy, broccoli, broccoli rabe, brussel sprouts, cabbage, carrots, cauliflower, chard, collards, dandelion greens, endive, fava beans, garlic, jicama, kale, leeks, mushrooms, onions, potatoes, scallions, spinach and sweet potatoes. #4 Chop all the vegetables in similar bite-size pieces, keeping each in separate prep bowls. 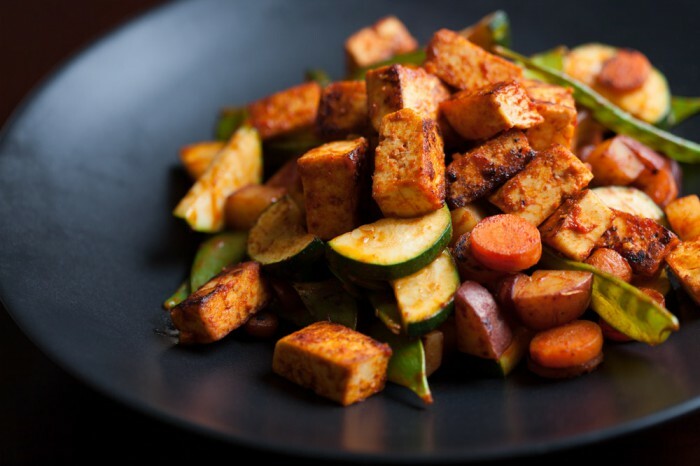 Cut the tofu into 1″ cubes or smaller, set aside. #5 Heat your pan or wok until very hot. Using minimal sesame oil, saute the tofu, stirring regularly until it has browned on most sides. Take the tofu out of the pan and set aside. #6 Start sauteing your veggies in order of density. Leaving ample time for ingredients such as potatoes to cook until almost tender before adding additional vegetables. Use your judgement on how long to wait before adding more ingredients. Leave greens until all other vegetables are completely tender. Toss them in. #7 Whisk together approximately 3 tablespoons of water per 1 tablespoon of bean or chilli paste, pour over stir fry and toss thoroughly. Do not overcook. The best flavours to emerge from a stir-fry are from the beautiful vegetables. #8 Explore, try new vegetables each time, and eat as much as you can. Tonight we made a stir-fry with broccoli, onion and peanuts. It wasn’t quite hot enough so we added Sriracha Chili Sauce. We served it over Amy’s organic brown rice noodles. It was divine. I’d love to hear what your favourite stir-fry combination is, leave a comment below!